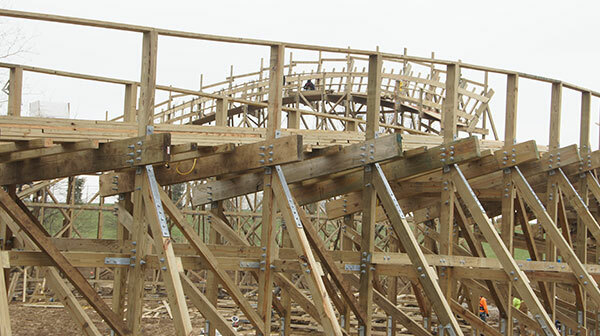 Home Worlds of Fun World's of Fun Shows Off New Timber Wolf Ending. World's of Fun Shows Off New Timber Wolf Ending. Timber Wolf Removes Last Helix, Replaces it With 70-degree Turn. This Dinn Corporation Wooden Coaster is known for being quite the rough ride, but with extensive renovations going on through approximately 2021, World's of Fun hopes to change the thoughts of guests braving the coaster. GCI, Great Coasters International, is doing the work for the park. Worlds of Fun’s first wooden coaster, Timber Wolf, helped put the park on the map. 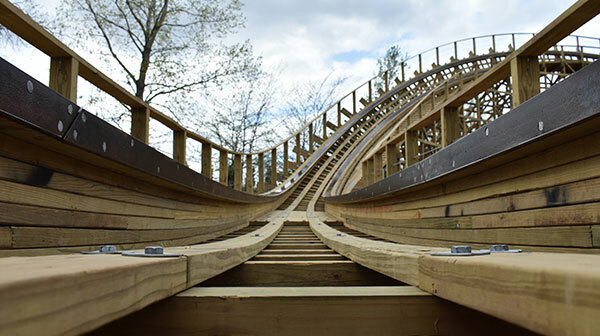 "After its highly anticipated opening, it won international honors as the top wooden roller coaster and continued to win accolades over the next several years. There’s no debate about it, Timber Wolf is a living legend, and this season - it will be reborn with a new finale to carry on its historic prestige." "The twisted ending has been years in the making. In addition to its new 70-degree banked turn, Timber Wolf has been receiving major renovations and investment over the past five years. The project kicked off in 2014 with an all-new operating system. In 2015, work continued with major re-engineering and re-tracking from the first drop through the previously existing helix. Now with its new banked turn, it is estimated that over half of the track has been replaced or reworked." The reconfiguration removes 360 degrees of helix, shortening the track. An original POV of Timber Wolf can be seen below. Footage by Coaster Force.